This is how De La Salle College’s new Glassmullin sports facilities will look – if they’re given the go ahead. 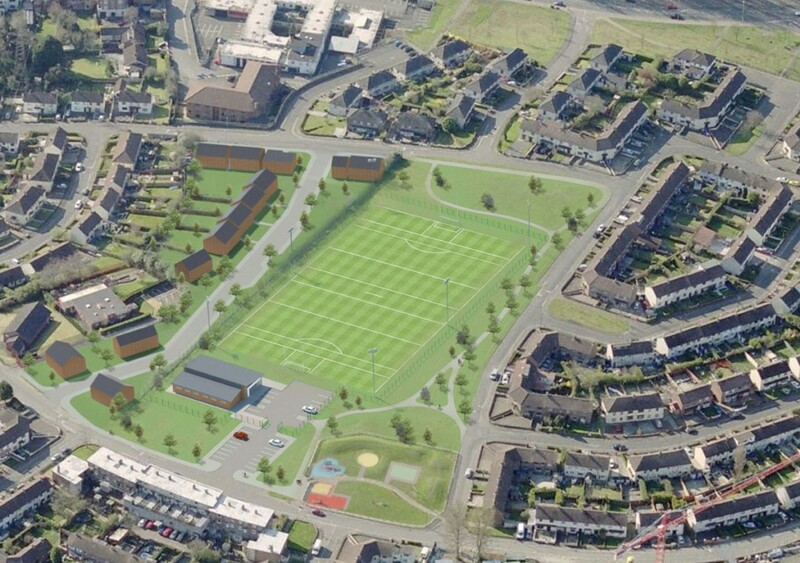 The Andersonstown school will today deliver images of their proposed development to residents living near the contentious piece of open land at Glassmullin Gardens. In recent months many locals have been campaigning to stop the school from building the state-of-the-art facility which will include a 3G pitch and changing rooms as well as environmental work. Homes in the area have posters in their windows proclaiming their opposition to the development. Although the school has been successful on the sports field it has achieved this despite having no sports pitches of its own. The field at Glassmullin, which they want to develop, is adjacent to De La Salle. A spokesman for the school’s De La Salle Glassmullin Committee said there have been genuine concerns raised by some local residents during the consultation process. “To address those concerns the school has twice reviewed our original proposal to take account of these issues. The image provided should hopefully clarify the exact nature of the plan,” he said. “The De La Salle vision is to build on the trust and expertise we have established with our successful indoor fitness centre and, with the ongoing support of our local community, further develop this model with the outdoor facility at Glassmullin Gardens. “We believe that in partnership with the community, Belfast Council and DENI we can apply our proven leadership and management capabilities to the provision of a top-class resource that will benefit the entire community. “This resource will enable our pupils to have their curricular entitlements met, as well as enhancing the extra-curricular opportunities they so desperately need. The spokesperson added that representatives from the school will be visiting residents today. n We’ll have all the local response to the blueprint in next week’s paper.